Brewing candy caps beers. Candy Caps add a distinct maple syrup flavor to a stout or a chocolatey porter. An excellent flavour for Canadians. Add 60 to 120 grams per liter for an earthy flavour favoured by the British. Found in hardwood and pine forest environments candy caps grow in moss, along roads and in rotting wood. Candy caps are ready for picking from mid-winter onwards. Easy to recognize with a broad cap that grows from 1.5 to 4.5 cm. They develop a depressed top as they mature. Candy caps are a rusty brown in color with pale pink gills. They bleed a watery latex liquid when damaged, and give off a faint aroma of brown sugar or maple syrup. 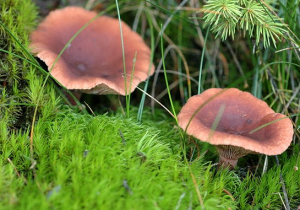 Its stem is up to 1 cm thick and tapers to a narrower base that hollows as the mushroom matures. These grow prolifically in the wild and do not do well grown at home. So you’re best to become a savvy shroom hunter in your area for best results.